While these quotes may make you feel good, they fall short when it comes to the practicalities of figuring out how to “make it so.” Instead of spending time only visualizing, wishing, or dreaming about achieving a goal, there is a system that can make you more likely to achieve your goals and dreams. 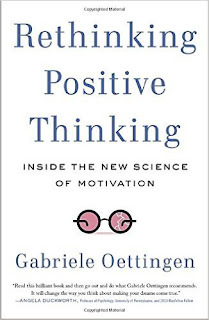 Mental contrasting is a visualization technique developed by researcher and professor Gabriele Oettingen and her colleagues, and is discussed at length in the book Rethinking Positive Thinking: Inside the New Science of Motivation. We shouldn’t stop dreaming altogether, though. In fact, dreaming is a big part of mental contrasting. However, it goes beyond the simple dreaming stage into more practical waters. Wish. Choose a wish or goal that is important and challenging for you, but one that also feels doable within the next four weeks. Outcome. What is the best possible outcome if you were to fulfill your wish? How would you feel? Imagine this as fully as you can. Obstacle. What is the biggest obstacle within you that stands between you and your wish? Figure out what that is, then take a moment to imagine that fully. 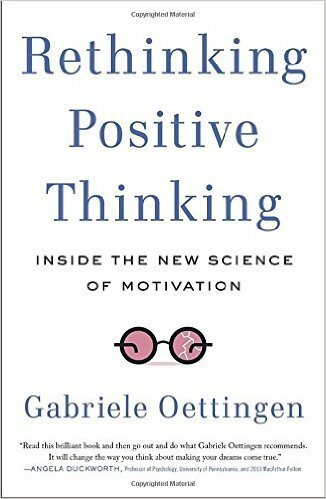 Just as The Upside of Stress changed and broadened my thinking about stress, Rethinking Positive Thinking gave me a new way to plan and execute goals and dreams, and I wanted to share it with you. For most people, happiness includes growth and accomplishment. Mental contrasting is one tool likely to help you with that facet of life. All the vision boards in the world will not help you if you do not act. Wishing does not make it so. But WOOPing just might. What goal, wish, or dream would you like to “WOOP”? Kathy this is a great concept you have discovered. Went over to the WOOP site. This sounds like a great strategy for accomplishing one's goals. Thank you for sharing. Have a super weekend. Hugs! Rita--Hopefully The Upside of Stress will help during your stressful time. I see that you're already looking for the upside in how you're feeling. Sending you good thoughts and a virtual hug. This, too, shall pass. Debbie--It's such a simple concept, really. It doesn't take very long to put into practice. Now if I'd just follow my own advice and put it into practice!